California-based HRL Laboratories has unveiled the world’s first 3D printed high-strength aluminum. The GM and Boeing-owned company’s product has also become the first additive alloy to obtain a registration from the Aluminum Association (AA). The Aluminum Association oversees alloy registration and product standards used throughout industry. 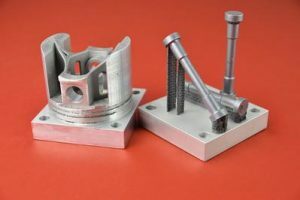 The association’s new additive alloy registration system was launched in February 2019 in response to a growing number of additively manufactured alloys. HRL will be granted registration number 7A77.50 for the aluminum powder used to additively manufacture the alloy, and number 7A77.60L for the printed alloy. The Aluminum Association is the industry’s leading voice in the U.S. and provides global standards, statistics, and expert knowledge to manufacturers and policy makers. Alloy and temper designations, chemical composition limits, and registered properties in North America all adhere to the Aluminum Association’s standards. The aluminum industry has over the years helped manufacturers produce sustainable and innovative products. These include more fuel-efficient vehicles, recyclable packaging, greener buildings and modern electronics. In the U.S. alone, the aluminum industry supports $174 billion in economic activity and nearly 700,000 jobs.